I'm proud to say that we didn't spend a dime on these! 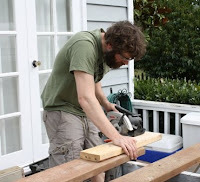 Truth be told, we did buy a box of nails for $14 but all the lumber was recycled from a pile of scrap wood on our property, we lined the bottom of the box with the mesh from an old trampoline, and some small rocks. 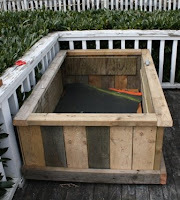 We need to get some soil to fill the boxes, which might actually cost some $, and then we're ready to plant. I also transplanted my silver thyme onto the porch, in the bucket above. We can't wait to eat home grown tomatoes, peppers, zucchini, and cucumbers. 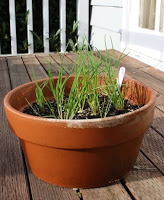 I was excited to see that my chives from last year have come up again! For those of you who don't garden, just plant chives--so easy and they smell delicious (and taste delicious in soup). I hope to have some updates soon! We just planted our veggies this weekend. I am busy making little domes for the plants out of 2 liter soda bottles for the nights it might still get cold here in Oakhurst. We are trying our first artichoke plant this year. Can't wait to see you!